Last month, from January 25-29, Christmasworld was held in Frankfurt am Main, Germany. It is one of the world’s biggest trend and order platforms for the international seasonal and festive decoration sector and attracted 45,304 trade visitors from 123 countries, including 16,100 from Germany. In total, 1,089 companies from 45 countries attended. And this year, it again seemed to be a successful event. Among the visitors, which were 67 percent play a decisive or contributory role in purchasing decisions, there was a 95% satisfaction with achievement of visitor objectives (in terms of new business connections, new products and customer support). Again this year, the Floradecora took place in the heart of Christmasworld, in Galleria 0. This exhibition aims to be a link between hardware and flowers, which this year was demonstrated through various sales concepts on the new Retail Boulevard. Last month, we were on location to make a photo report. 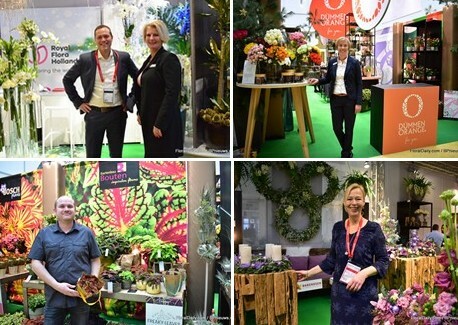 From the top left, clockwise: Auke Heins and Caroline Janknegt of Royal FloraHolland; Sonja Dümmen of Dümmen Orange, Caroline Haakman of Barendsen and Michael Bosch of Bosch Plants.